Categories: Conitec, New Products, Programmers, Universal Programmer. Manufacturer: Conitec Datensysteme, GmbH – Germany. 3 linear voltage regulators for internal power supply. Warranty Term: 24 Months, comprehensive. USB Powered (has three-way power). True Palmsize – fits into a shirt pocket, weighing 6 ounces. JTAG Debugger built in (two tools in one). Custom built low-power integrated pindriver IC’s. 200 MIPS ARM-9 controller running under embedded LINUX. 64 MB Data RAM on board. 100% Scriptable OS – Script Controlled. 100% Open Source Firmware (create your own custom applications freely). Windows (through Win 7) and Linux (Mac Version pending 2011). First programmer to handle 62,000 devices at a net cost of less than $0.01 cents per device. First programmer that can run all day drawing power via USB cable alone. First programmer that is remotely accessible across a LAN/ETHERNET network (the Galep 5D models). First programmer that has both USB and ETHERNET ports (the Galep 5D models). First programmer having 64 MB – 128 MB RAM built in to the design. First programmer with 6 dedicated sub-microcontrollers on board, for precision functions. First programmer with a JTAG debugger tool built into it (two tools in one!). First programmer that has a LINUX operating system available (A MAC version pending). First programmer that boots a 200 MIPS ARM-9 processor under embedded LINUX. First version of this same architecture that fits in a shirt pocket & weighs 6 ounces (Galep 5 weighs only 170 grams!). (** this is due to advanced low-power custom-designed integrated circuits not found in any other models). The new GALEP-5 is the first palmsized self-powered universal device programmer. 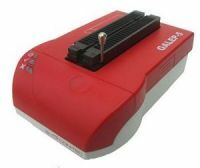 Due to its size and power supply independence, a GALEP-5 is the ideal solution for development and service. Its high speed allows using it as a production programmer. And with its JTAG debugging capabilities it can also be used for microcontroller development. And with its JTAG debugging capabilities the Galep 5 can also be used for microcontroller development. That’s a versatile talent in a programmer – for the lowest price per device in the industry! GALEP-5 is a universal programmer for devices of the following types: EPROM, EEPROM, FLASH memory, serial EEPROM, NV-RAM, LPC, FPGA, PLD, EPLD, GAL, PALCE, PIC, Microcontroller (MCU). More than 60,000 device algorithms are currently supported. Additionally, GALEP’s JTAG player can program SVF/JAM data into all existing and future devices that have a JTAG port. The GALEP-5 device programmer fits into your jacket pocket and weighs less than 200g, compared to the 3 – 4 lbs weight of other programmers. Galep 5 has three-way power (rech. batteries, conventional power plug, and powered via USB from the PC). Standard operation is completely powered via the USB bus and does not normally require any additional power supply. When the programmable device consumes more than 500 mA, (e.g. for a few old NMOS devices and microcontrollers), the included power adapter or the rechargeable batteries (6xAAA) can be used. GALEP-5 is uncompromisingly designed for speed. An internal 200 MIPS ARM-9 processor handles the data transfer, while a 50,000 gates FPGA (user-programmable logic) controls the pin drivers and accelerates programming algorithms by setting up device-dependent state machines and UARTs. This level of hardware acceleration makes GALEP-5 one of the fastest device programmers on the market today. For instance, a MB91F467 Fujitsu Microcontroller (8 Mb) requires only 19 seconds for a serial program/verify cycle. A 256 Mb NOR Flash (28F256P30) is programmed and verified in 170 seconds. An internal 64 MByte RAM serves as data storage permitting transfer of data once only, to then program multiple devices. > Switching regulators for programming voltages controlled by D/A converters in 100 mV steps. > Further D/A converters control logic levels and input threshold. > All voltages permanently monitored by independent circuits. Switching regulators for programming voltages are controlled by D/A converters in 100 mV steps. 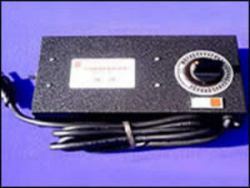 Further D/A converters are used to control the logic levels and the input threshold. For maximum protection of the programmable device, all voltages are permanently monitored by an independent circuit. Signals for In-System Programming (ISP) can be taken from a separately available ISP adapter or directly from the 48-pin ZIF socket. Help files provide information about the wiring of the target system for any supported components. The software is available in versions for Windows 95, 98, ME, NT4, 2000, XP, Vista, Windows 7, and LINUX. A Macintosh version is pending in 2011. Besides basic functions such as erase, read, program and compare, split and shuffle, it features easy-to-use configuration options for any special functions required by the selected device. GalepX software supports all common file formats, such as binary, Hex, JEDEC, and JTAG. Mass production is supported by providing statistics functions and serial number generation. Delete, program and verify components with JTAG interface (joint test action group, IEEE Std. 1149.1 ). The following formats are supported: SVF-Script in XSVF(Xilinx) format; JAM byte code player (ALTERA). Batch mode: Run GALEP-5 from the command line (it also sets up a virtual IP address on your network), or implement GALEP commands in your own production software. The programmer can be completely controlled by a set of powerful batch commands. The software is permanently improved for supporting new components. If you require a device that’s not yet supported, use our free Device on Demand Service. Free updates are available on our website in regular intervals. With GALEP-5 you can debug any Microcontrollers with a JTAG interface that are supported by the OpenOCD (On Chip Debugger) software – ARM7, ARM9, XScale, and Cortex-M3 MCUs. The chip to debug is merely inserted into GALEP’s programming socket or connected to the GALEP via a cable or ISP adapter. 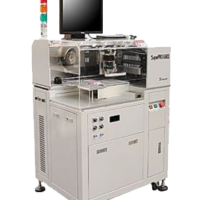 Additionally you can easily define test algorithms for in-circuit testing of complete circuit boards (Boundary Scan) for small series production. Your palmsize GALEP-5 programmer becomes a complete development, test and production system! GALEP-5 programs any supported devices in a DIL socket up to 48 Pins, between 300 … 600 MIL (ca. 7,5 …16 mm) width, without needing any additional adapter. Universal socket adapters are available for all components ranging up to 48 pins. Only one adapter per socket is required. A tiny programmer with a highly efficient socket adapter footprint. Few adapters = small system costs! Adapters for components with more than 48 pins are also available for this palmsize model. In the case of these device groups, because the pin capacity of the programmer is smaller than the pin count of these higher pincount components, such adapters are necessarily specialized. If you need to program components with a high pin count frequently, a GALEP-5D (with 60, 120 or 240 pin-drivers) provide even greater socket efficiencies. All GALEP-4 adapters are also completely compatible with the new GALEP-5. Adapters for the following sockets are available: SOIC, SOP, TSOP, SSOP, TSSOP, PLCC, QFP, TQFP, MLF. “Master modules” reduce socket adapter requirements notably over time, especially in the higher pin count packages and when clients want to set up gang-programming systems. Therefore separating out master-module equipped programmers (see comparative chart here: http://www.conitec.net/english/comparison.php) helps to obtain a clearer comparative picture of what’s compared to what in this production-class programmer segment. In the master-module-equipped programmers below, the Galep gang programmer models stand out for their very compact, low power architecture. The Galep programmers in this line up are the only ones to use a custom designed, low-power integrated circuit design, which is what permits their ultra-compact size. Galep programmers require no cooling vents or fans, due to this custom designed pin-driver IC. The high end Galep 5D’s (60, 120 and 240 pin) are built into a single-milled block of aluminum barely an inch tall, and require no ventilation. Some programmer manufacturers list each minor sub-type of every supported device as a separate “supported device”, which greatly expands the aspect of their published device libraries. For instance, the same GAL16-V8 device made by Lattice appears up to 400 (!) times in some manufacturer device lists. It is important to distinguish therefore that the advertised number of devices unless clearly broken down by the manufacturer into accounting methods, is not necessarily a clear benchmark for comparison. At first glance, the Conitec device list for this group appears to be much shorter. The equivalent Conitec GAL device support is listed as follows ( http://www.conitec.net/english/galep5Ddevice_list.htm ). However, this 12 item list of GAL’s supported by the Conitec GALEP programmers, actually produces 28 devices also – but it is presented in a consolidated, rationalized format for easier device look-up. Conitec programmers ship with a comprehensive 24 month warranty. The GALEP programmers have one of the lowest hardware damage claim rates in the industry (1% – 1.5% worldwide annually). Custom-built integrated pin-driver IC’s permit these programmers to have many fewer parts, and markedly lower power consumption than most of the larger, heavier programmers on the market. Fewer parts = longer hardware life.